Cassia cinnamon (Cinnamomum cassia) - also called Chinese cinnamon - is the potent, stronger cousin of the more delicate Ceylon variety and is member of the laurel family. Harvested from the bark of the tree, which is then peeled, curled and dried into sticks. This process is very labour intensive and undertaken by highly skilled workers. 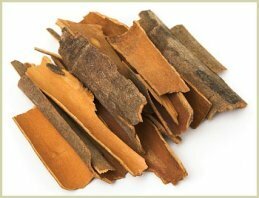 Cassia is made of one thick slab of bark, instead of thinly layered, like the inside of a cigar. The texture is much thicker, and far less crumbly than the Ceylon variety. 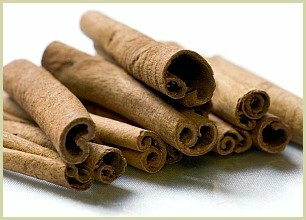 It's a close relation of Saigon cinnamon, and today it's grown mostly in China and Vietnam, and it is sold almost exclusively as “cinnamon” in Canada and the United States. Dried cassia bark has been used in traditional Chinese medicine for centuries, and it is considered one of the 50 fundamental herbs and spices. Read more about cinnamon health benefits. One of the first written references to cassia was in ancient Chinese literature around 100 BC. From China, its use as a food flavouring and a medicinal spice travelled down the Silk road into the Middle East and Southern Europe. When it made its way to Europe, it rapidly became an important part of the global spice trade. Ceylon, in particular, became a valued commodity for European markets, and the fact that it only grew in one place, and was completely controlled by one company and one country, made it a very expensive commodity. So it was reserved only for the ruling class. On the other hand, cassia cinnamon had multiple sources in multiple countries, and so it was far less expensive. It was also close enough in flavour and texture to Ceylon to become an affordable alternative. Click for more on the history of cinnamon. Beware, cassia is tough to grind, and can easily snap the blades on your electric grinder. ...Break the stick into smallish pieces before putting in your electric grinder. Before you start grinding turn it upside down, and only when the blades are spinning at full speed, turn the correct way up. This prevents chunks getting under the blades and should help protect them. I do recommend grinding yourself rather than buying the ground stuff. Pre-ground quickly loses its flavour and potency, so doing it yourself is preferable to buying bland store prepared powder. Whilst I use the Ceylon variety for my puddings and desserts, the flavour of cassia is stronger, so I tend to use it in my more robust dishes and masala blends. More on the uses of cinnamon.